Osseo-integrate Yourself South of the Border! Have you lost a tooth? Would you like to replace it with a Dental implant? In Mexico, you can find the best dentist for successful Osseointegration of a dental implant. Osseointegration is the fusion of a dental implant post with the jaw bone. You can also call it “bone integration”. Osseointegration is what makes a dental implant successful. Without osseointegration, the dental implant fails. Why do I need an Osseointegrated Dental Implant? 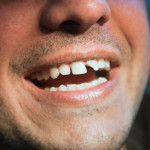 Although there are many options to replace a lost tooth or multiple teeth, dental implants serve to be the most stable. 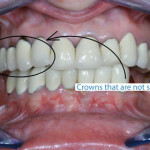 Bridges, crowns and dentures tend to be more short term as compared to dental implants. They can break, dislodge and even feel unnatural. A successfully osseointegrated dental implant can last a lifetime, being a one-time investment. Dental implants are more expensive than other dental prostheses, but in Mexico you can find highly professional dentists to place dental implants for a fraction of the cost. One of the key qualifications you must look for in a dental implant doctor is extensive training in osseointegration of implants. This is especially crucial if you need multiple teeth implants, such as with full mouth restoration, to protect your investment in your oral health. How does a Dental Implant Osseointegrate? Perfectly osseointegrated implants installed by a dentist in Los Algodones, Mexico. In this Xray, you see healthy jaw bones supporting multiple implants. The strong osseointegration allows the implants to support dental bridges. Performed correctly by an experienced surgeon and prosthodontist in Mexico, these bridges will last a long time. A dental implant is made of the precious metal Titanium Oxide. The reason is that Titanium possesses the unique property of attracting bone-forming cells, called “osteoblasts”. When the implant is placed, osteoblasts are triggered. They begin to deposit on the implant surface, creating new bone around the implant. 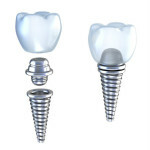 This forms a well osseointegrated implant, with good life-long success. 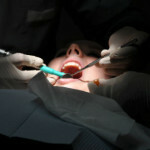 Why Choose to have Dental Implant Surgery in Mexico? 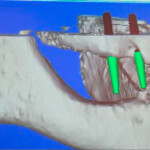 Hybrid Prosthesis supported by dental implants. A strong integration between the jawbone and tooth implant post is crucial to have implant supported dentures that last a lifetime. In USA, cost of a single tooth implant including the crown is between $4,000-5,000. In Mexico, you can have exactly the same quality of treatment by an equally trained and qualified dentist at a fraction of the cost ($1400 – $1800). “Feels Real”- Implant is osseointegrated fully within your jaw bone, making it look and feel completely natural! Preservation of jaw bone – Implant osseointegration promotes bone formation and preserves the existing jawbone from degeneration. Preserves other teeth – Neighboring teeth are not compromised by the need for supporting dental prostheses. Cleansable –Oral hygiene is as easy to maintain as with natural teeth. Better Esthetics – Improved facial esthetics in contrast to tooth replacement with other dental prostheses like dentures. If you have a lost tooth but cannot afford a dental implant in USA or Canada, we suggest travelling to Mexico. Enjoy the trip, save your money and invest for a lifetime! To learn more about finding a qualified implant dentist in Mexico that have extensive experience in installing properly osseointegrated implants, contact Dayo Dental or call 877-987-3296.